Story: Cor's father Nobyl came to Earth in the late 19th century. What he was doing on Earth was not revealed except he was an artist and tried not to be noticed . How he met Linette Hartford and exactly what happened was not revealed either. He was kidnapped by Cyrus Benjamin and Jonathan Deskinn in 1980 after which Cor lived with his mother. It would seem that they tried to find him but without success . In 1994 Cor got a lead on his father's whereabouts by accident. The hood Paulie Bartilucci was infected by an alien virus, which made him strong and agressive when he drank alcohol. The virus was based on the alien technology, which could be from Cor's father . Bartilucci died before Cor found out where he had been infected, but Bartilucci's two girl friends who had both been infected by Bartilucci, had some of his things leading Cor to his father, his half-brother Ajax and the kidnappers Cyrus Benjamin and Jonathan Deskinn [4-5]. Cyrus Benjamin and Jonathan Deskinn had kidnapped Nobyl in order to get hold on his spaceship. Torturing Nobyl for 15 years hadn't worked but torturing his wife made him give up the location of the spaceship instantly. Ajax being a human/alien hybrid produced from Nobyl by Deskinn could get past the ship's defence system, and upon entering Deskinn took control of the ship. Cor fought Ajax and Cyrus. In the fight Ajax accidentally killed Deskinn and Cor was able to take control of the ship just before his fathers people came to Earth . 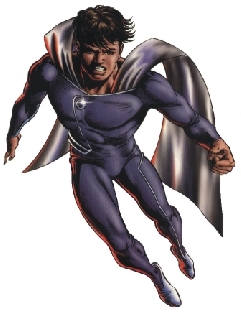 Skills & abilities: Super strength and regeneration from an alien medicine left by his father. Equipment: Cor had a gravity vector suit giving him flight capability and a cape, which could be used both defensive as shield and offensive e.g. holding or striking opponents. He also had Snoopy a sentient machine formed as a wristwatch. Snoopy was more of a friend than a piece of equipment.